Jute ribbons & jute tape that we offer is manufactured using best quality of jute. Different sizes of jute ribbon and tape are available as per the need of our customers. These have a very long durability and are available to our customers on very decent prices. deyed jute ribbons. We are one of the widely acclaimed manufacturers, suppliers and exporters of Jute Ribbon. - 6 cm jute ribbon. - 3 miter a roll and 36 gm per roll. - Available color green, red, violet etc. We are manufacturing our product as per buyer requirement. Jute webbing, Jute tape, Jute belt, Jute strap for binding of shoes & sandals, bag handles, tree ties, etc. 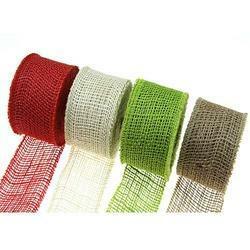 A wide assortment of Jute Net Ribbon is offered by us to customers in bulk at most reasonable prices. Further, the offered Jute Net Ribbon is extensively used for floral arrangements, basket wrap and in many other decorative purposes. Moreover, the offered Jute Net Ribbon is known for their premium quality. We are offering Colored Jute Ribbon to our Client. We are engaged in offering Colorful Jute Ribbon. The offered product is designed and developed under the guidance of our adept professionals. Jute Ribbons are decorative ribbons. These ribbons are available in a variety of designs, colors and patterns to meet the different needs of our clients. Jute ribbon is one of our prime product. We are leading exporter and manufacturer of jute products. If anyone has requirment of this products feel free to contact anytime. Our mesmerizing range of Fruits & Trends are everlasting and exhibit the true beauty of spring. These dried flower pods are available in vibrant colors and can enhance the beauty of any place.